Last weekend was a very special one. 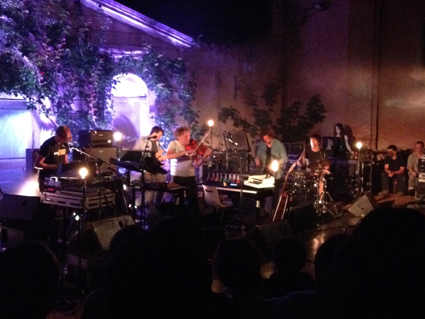 One of my favourite musicians, Yann Tiersen, was playing at the Monforte d’Alba Jazz Festival. This was the second (at least) time he has played at the small, beautifully situated amphitheatre of the Auditorium Horszowski, and I was there in 2011 also. It was a magical concert on both occasions and the setting could not possibly be improved (although rain would not do it any favours!). The bar is in an old church, and the wines on offer were generous measures of local producers. What other concert could you possibly go to and be served Conterno Barbera d’Alba in a (full) plastic cup for €3? Of course, one of the attractions of this event was the location. Monforte is one of the eleven crus of Barolo, and one of its prettiest villages, although in truth I think this part of the Langhe in Piemonte is probably my favourite, and one of the most beautiful, wine regions on earth. I feel very lucky to live only a two and a half hour drive away. I’m not alone as my friends Paul, Chrissie and Keith, all prior visitors, were also up for the weekend’s experience. 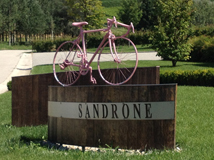 Naturally we booked in to visit a favourite producer as part of our weekend, and I had the opportunity to take up a longstanding invitation from Sandrone. Not normally open to the public, and producing mesmerizingly good wines, this is a very special thing. 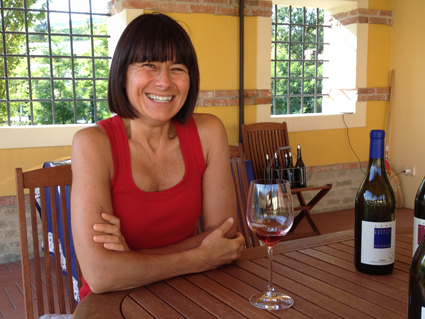 We met the charming Barbara Sandrone, whose father Luciano is the winemaker, and a stalwart of the new wave of Barolo producers. The family were originally carpenters from La Morra, but Luciano had different plans, and via apprenticeship and working at Borgogno eventually becoming cellar-master at Marchesi di Barolo, his obvious talent shone through. 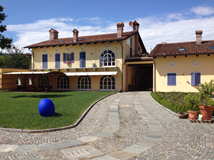 His first vintage on his own was the 1978, and – along with a wave of other small producers, notably Roberto Voerzio, the future of Barolo as a dynamic high quality wine region was assured. They now have 27 hectares across the Langhe, including a substantial 2.7ha of Barolo’s Cannubi Hill, one of the regions finest and best –sited. 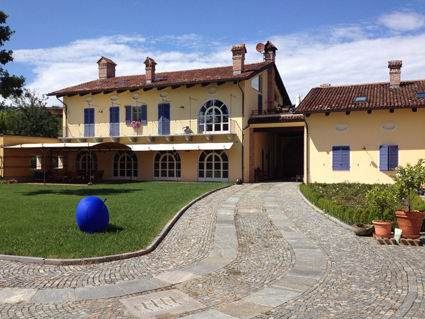 It is here that their new, but tastefully traditional, winery and home is situated. Built in an astonishing 10 months, the winery is meticulous and perfect for its needs, and incorporates many touches of traditional architecture such as beautiful vaulted ceilings, all neatly working in harmony with state-of-the-art features such as complete temperature control and ingenious gravity-fed pumping from grapes to wine. There are fine wines in total, and we were lucky enough to try the current release of each with Barbara. Only bottled last week – no bad thing with the lively juicy Dolcetto (little sweet one), this had bright berry fruit and fresh acidity. Chillably fruity and deliciously easy to drink. This is quite a serious style of Barbera, notably deeper in colour and with the whiff of its 14 months in oak. This has spice and violet fruit with super-ripe dark cherry and mocha flavours, and a cherry-coke like finish. But in a really good way. This is from an exquisitely sited steep-sided vineyard in the Roero, in the north of the Langhe and on the other side of the Tanaro River, and sandy soils, as opposed to the clay of Barolo. 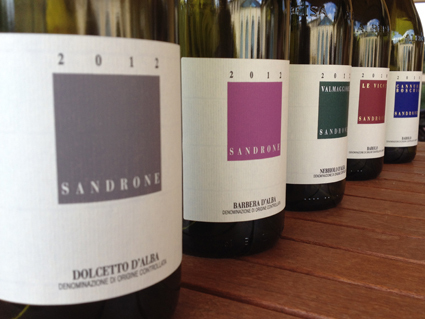 The colour is light (even for Nebbiolo), but red throughout and no orange rim. It is a pure expression of the grape, with strawberry and raspberry fruit aromas and flavours, and a little baked orange and spice. Very rounded and soft, with excellent freshness, this is one of the most approachable young Nebbiolos I have ever encountered. The extra time in oak (2 years) demanded by the Barolo DOCG has softened the colour and given the wine a brick red edge, but it is still deeper than the Valmaggiore and promises much on the nose with dark fruits: plum and rose-hip as well as fruitcake and earthy spice. The tannins are apparent and strong but not overpowering in the lick-your-teeth way that some Barolo can be. Although it has a long life ahead of it, it’s young, warm, flavoursome and delicious even now. This is a top, single vineyard wine from one of the best sites in Barolo. The aromas are very rich and spicy with plenty of oak, toast and smoke. There is a herbal, minty sage like touch to the fruit both to smell and to taste. This is a top class wine, with a silky texture, abundant but balanced tannins, a mouth-filling flavour and a great long finish. Wonderful.